The auto insurance giant extended its positive business momentum with strong second-quarter results issued last month. Auto insurance giant Progressive (NYSE:PGR) outpaced the market by gaining 13% last month compared to a 3% increase in the S&P 500, according to data provided by S&P Global Market Intelligence. The rally added to solid gains for long-term investors, who've seen their shares trounce the market over the past one-, three-, and five-year time frames. 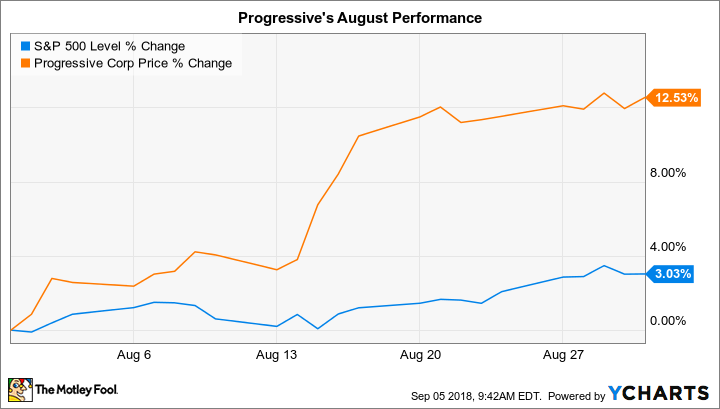 Progressive reported second-quarter results early in the month that contained more evidence of the market-beating operating trends that investors have come to expect from the insurance leader. Premiums jumped 21% in the first half of 2018, executives said, and underwriting margin improved to 10.3% from 7.5% in the prior-year period. In a letter to shareholders, CEO Tricia Griffith highlighted the fact that Progressive just moved up one spot, to No. 3 from No. 4 in the list of the country's biggest private auto insurers. Progressive has a long track record of industry-trouncing growth, which suggests it enjoys significant competitive advantages that should accrue to investors over time. Those gains will be volatile, since they depend to some extent on the pace of weather catastrophes like hurricanes, flooding, and hail storms. But, as the company grows, it becomes better capable of absorbing events like these, as it did in the most recent quarter, without sacrificing profitability.